Jeanne Bice was an adorable designer who sold her Quacker Factory line on QVC. 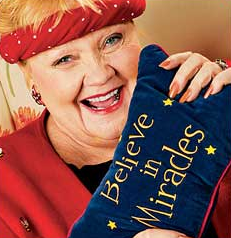 She always wore a fun headband and her fans could get enough of her personality or her colorful designs. She passed away at the age of 71 on Friday, and sources say it was from cancer, but that hasn yet to be confirmed. She loved QVC. Everything about it. She loved the people: the executives who ran it, and the production people who worked so hard to make every show perfect. She loved the famous stars who appeared there, and had to pinch herself when others considered her one. She loved the hosts of her shows, her buyers and all the people who worked with her and for her to make Quacker Factory clothes a reality. Jennifer Aniston Turns Homewrecker Now?